yeah that is true though from a operational standpoint, air gets its great throughput with a dual station, the beauty of the Vekoma flying design is you dont need a dual station to maintain the high throughput as the unloading, loading and restraint checks are more inline with a standard coaster without requiring extra staff or time to rotate seating. 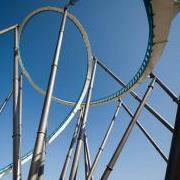 I think that firstly the should focus on retheaming coasters such as saw, loggers leap and stealth. After that I think that Colossus should be completely taken out than replaced with a horror themed ride and maybe it could be the scary side of the park along with saw. I honestly think for the next coaster's theme I would like something simple but effective. I think we have enough dark and drab themes in the park so I guess I would like something more up-beat and fun. I actually like Stealth's theme in that regard- its simple, but overall the theme has some quirky music and the area has a fairly up-beat feel to it. I wouldn't mind Colossus getting the axe though.. I guess a tacky horror theme ride would be better than the unintended neglected theme Colossus currently has..
For Loggers, I guess they could go for the neglected feel.. wouldn't take much effort.. The last thing Thorpe needs is another horror or dull/drab theme. Anyone got any updates on this topic? I still think a B&M hyper, or at least that model (if the 50m height restriction is imposed) seems likely, and would absolutely be the best thing for the park. I know everyone talks about RMC, but that just seems a bit unlikely. Would like to continue the speculation, as rollercoasters are the key part of the park, imo anyway. I'm kinda surprised Merlin haven't opted for a RMC yet, if you look at the cost of them they are actually quite cheap! I think Merlin could easily market any type of RMC, it would also give the park a fun airtime machine. Cost wise Wildfire set Kolmården back just under 10 million quid, and that is one of the larger RMC'S.. Even if they built a tiny one I think it would be the best in the park, but sadly I don't see Merlin pinning down RMC or Vekoma anytime soon.. Which is a huge shame. A B&M Hyper would be really cool but I think it would be one hell of a risk especially when it comes to money. I think a Hollywood Dreams style ride would be cool, but that would probably still cost a lot and I'm not sure where would be feasible to put it. Texas Giant's problems were due to the trains which were done by Gerstlauer. Steel Vengeance was a hiccup, but nobody got hurt and the incident was overall very minor. I think they should get a Mack coaster. Make one better than Icon ? Unfortunately a company trying to recover from a serious acident really can’t afford “hiccups” like that - imagine the headlines if that was a Merlin Park! A similar incident in scale has happened at Alton Towers too! The only difference really is that Cedar Point got incredibly unlucky and it happened during opening day- besides that, just like the little bump on Spinball, nobody got hurt and nobody was put in danger. So yes it has happened at a Merlin Park! Difference is that the Spinball incident happened at Towers and Merlin know what caused it. They hear that a manufacturer has a big new ride, and on its opening day, two trains bumped together. This follows another incident where they got another manufacturer involved in one of their rides, which directly caused the death of a person. They might still go for an RMC. But you can understand why they'd perhaps be against introducing one of safety grounds. The chances of Merlin currently getting an RMC are equivalent to Ripsaw, Loggers and Skyway reopening at the end of this summer. In other words, virtually impossible. Unfortunately, with the recent such incidents and corporation with financial struggles and safety exaggeration that will not happen. Shame really, but there are hopefully still other options they could go for. Merlin still work with Intamin though, despite having countless safety incidents on their record.. I think that logic is beyond stupid, every manufacturer (maybe bar B&M) have had a incident on at least one of their rides, does that mean Merlin should rule them all out? RMC somewhat have a decent record compared to the other manufactuers with Steel Vengeance being the first incident that was actually anything to do fault-wise with RMC (Texas Giant was a tennis match between Six Flags and Gerst). RMC is certainly unlikely for a Merlin Park, but I think when it comes to safety Mack and Intamin aren't exactly better when it comes to the safety record.. I guess it also comes down to context a bit. RMC's most notable accidents are almost definitely as a result of a manufacturer fault, as opposed to how the park has operated / maintained the ride. For a new company, that could ring alarm bells to potential clients. Other manufacturers will have plenty of incidents attached to their rides, some as a direct fault of them, some as a result of the park (I'm willing to bet that a greater majority are down to park error). But they will all have a much larger track record of success, and Merlin will have an established working relationship with those manufacturers. Of course, we don't know what goes on behind closed doors, at both ends, so who really knows what they think. Maybe Merlin have no concerns about getting an RMC. Maybe we are getting one in 2020. Fairly certain that when Heide Park announced they were reopening Colossos, they said they considered making it a hybrid, Which almost definitely would have meant RMC would have been involved, but they decided to keep it as it was or something? At the same time, if Merlin didn't want to go to RMC over concerns about the safety record at the moment, I could see why. RMC was also considered for Wicker Man very early on in the planning process, but they instead opted for GCI. Honestly if Thorpe Park give us an RMC, I will forgive them for the Loggers Leap treatment!! They are amazing coasters and pretty much all of them get good at worst reviews so they could open the worst RMC and it would still be an instant hit to the UK audience. Heck if they want to slap an IP on it to market it, go for it!! Hell theme it to “My Little Pony” and market it as “worlds first My Little Pony coaster” if you want merlin!! Just seems a no brainer to me for parks to get an RMC. Airtime in abundance, unreal transitions and that perfect mixture of fun and intense. Agree totally!! An RMC would be an awesome choice!! We saw what happened at Towers when they got a more traditional woodie!! I wouldn't mind seeing a Vekoma similar to the one proposed for Energylandia, it looked like a solid hyper coaster, plus new style vekomas are much smoother and reliable than before. It's cheaper than a B&M too. Let's face it, we're not likely to get anything world class whilst Merlin are at the wheel. The decline of Thorpe, Towers and Chessington under them is a little bit heartbreaking. Thank god we have Europe on our doorstep, I'm currently planning a trip to Liseberg in June and either Walibi Holland or Phantasialand later in the year. I haven't been to Thorpe since 2015 and I'm honestly not arsed, I'd rather spend the extra money going abroad to parks that are run properly! To give Merlin some credit, I would say Wicker Man is approaching world class. 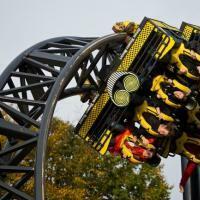 However, the problem is always maintenance of effects and presentation - see The Smiler ? Wickerman is a fantastic coaster and goes to prove that a coaster doesn’t need to have a ton of inversions or gimmicks to be brilliant. Totally agree regarding maintenance - The Smiler station/queue line looks bloody awful and neglected and this is a ride that only opened 5 years ago. I swear that’s the reason that TP like the run down look a la Saw, Swarm, TWD. Although they need to keep things looking good (and effects working) I think anyone caught damaging theming should be chucked out if caught - maybe that’s harsh but it really creams my corn that some people have no respect - an example is when I saw a girl ripping a bit of a poster by the door to the pre show on DBGT - I was so close to saying something but her nails were like a bloody weapon and I didn’t want to risk getting my eyes ripped out. One of the things that stood out for me (among many) when I visited Efteling and Phanny land last year was the lack of graffiti- sad that I should notice but you see it everywhere in U.K. parks (notible exception being Paultons). As for Thorpes next coaster - I’d love to see a woodie on the loggers site - well I’d love to see loggers return but that ain’t going to happen! And with it being wood they could call it loggers leap and brand it as a worlds first coaster named after a former ride which has been sat neglected for 3 seasons. In all seriousness I think WM has been a huge success for Towers and a ride similar at Thorpe would be fab - with a slightly lower height restriction it could potentially entice the family market which at the moment is lacking especially in coasters since the retheme of X - you’ve got the big coasters and then Flying Fish so a coaster in between that is thrilling but also fun and not overly scary would be an option.